It's amazing what one can accomplish when the baby sleeps. Sugababe 3 took an unprecedented 2 hour nap yesterday and I immediately got to work on this Pandan Chiffon Cake. It's a recipe from the well-known food blog ieatishootipost that I had been dying to try for some time. I am pleased to report that the Pandan Chiffon turned out as fluffy, moist, voluminous and delicious as promised, and is easily the best chiffon recipe I have tried so far! In particular, I really liked that the recipe asked for the additional step of beating the egg yolks until light and lemon-coloured. Most chiffon recipes only call for the egg whites to be beaten to stiff peaks, and for the egg yolks to be mixed with the other ingredients (i.e. oil, milk, etc). Beating the egg yolks until they are light does make it easier to fold the egg whites in at the later stage, and also seems to incorporate more air into the batter, which is a good thing. I will definitely be using this technique for all my chiffon cakes from here on. 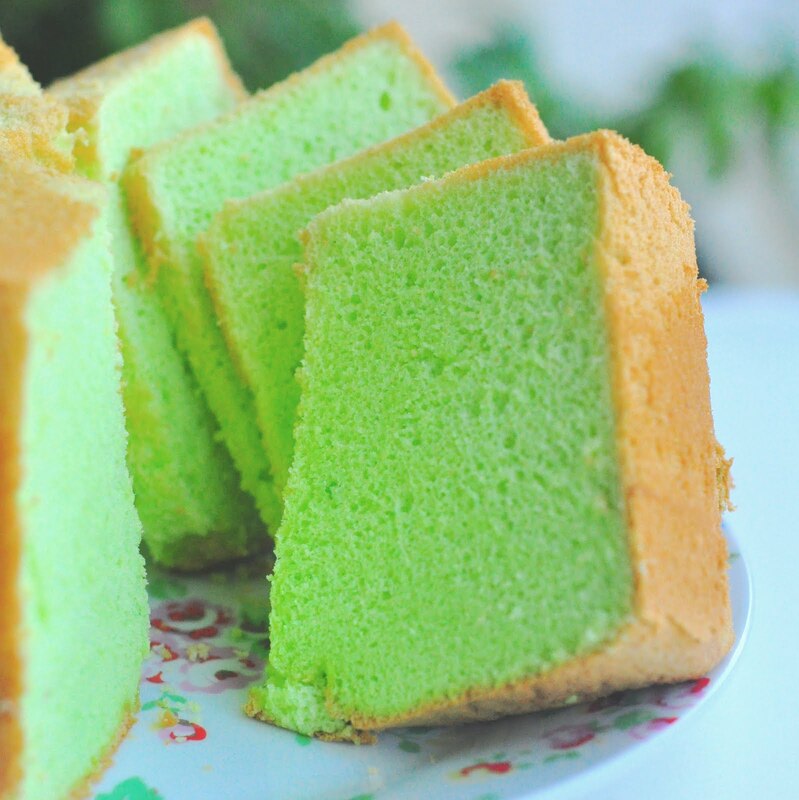 If like me, you have none-too-fond memories of dry, coarse and scarily mutant-green pandan chiffon cakes sold in local bakeries, you will be won over by this recipe. My Sugababes, who are partial to soft, fluffy cakes, absolutely adored this cake. And as I always say, anything that my picky eater Sugababe 2 willingly devours, is a must-try! Sift cake flour and baking powder, mix evenly. Set aside. Beat egg yolks and sugar until light and lemon-coloured. Add in the oil, coconut cream, pandan juice, pandan essence, vanilla essence and salt. Sift flour and baking powder over the mixture. Mix well until smooth. Beat egg whites with wire whisk attachment until slightly foamy. Add cream of tartar, and beat until soft peaks. Add in sugar tablespoon by tablespoon and beat until stiff peaks form and mixture does not slide out of mixing bowl when upturned. Add in 1/3 of the beaten egg whites into the egg yolk mixture and mix gently with whisk, to 'lighten' the mixture. Using a spatula, fold in the rest of the beaten egg whites into egg yolk mixture, gently, to prevent batter from deflating. Do not overfold. Pour batter into 25cm ungreased tube pan. Run a spatula through the batter to eliminate large bubbles in the batter. Remove cake from oven, prop it up on a bottle to cool, upside-down so as to prevent the cake from sinking. Once cool, remove from tube pan by sliding a knife along the sides, and bottom. To serve, cut with a serrated knife (so as not to flatten the cake). This cake looks fantastic! I would love to try it! Glad you liked the recipe! Your cake looks excellent! Hey Mar, thanks for visiting! I made a batch 2 days ago.. it came out soft and fluffy. Only the pandantastee is too weak. I mafe the paste the same day so it did not sit long enough for me to drain out some water. Making another one again today.. hope it comes out as soft as last time.. thanks for the recipes. I like to use pandan paste. So that mean 2tbs pandan juice +2ts pandan essence =3/4tsp pandan paste. Is that correct? Hi yes the 3/4 tsp pandan paste is to be used in place of pandan essence and juice. A normal round cake tin will not do - the cake will collapse or not rise. You need to use a tube pan otherwise known as a chiffon pan. Hi, thanks the recepi. I would love to try but just want to check if I could replace the Pandan juice & paste I with more essence or with water. Thanks a lot! A Spoonful of Sugah. Watermark theme. Powered by Blogger.